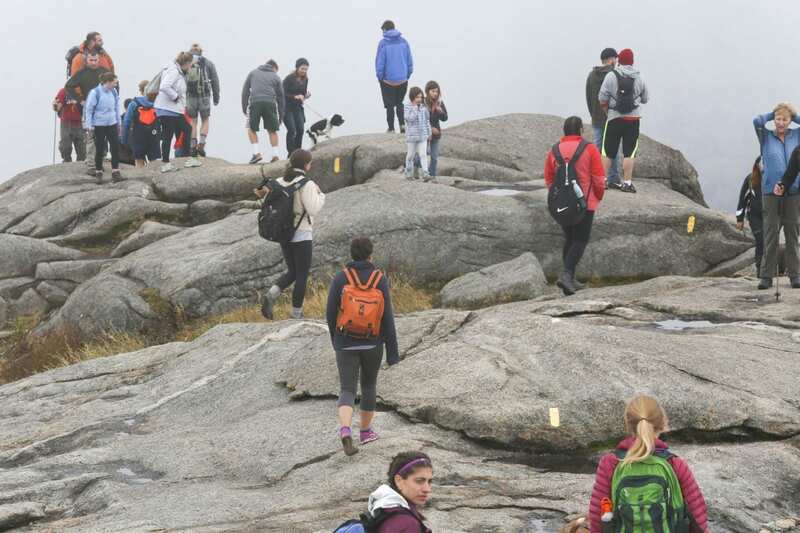 LAKE PLACID – This summer, the Adirondack High Peaks Summit Stewardship Program reached a new milestone, educating half a million hikers on New York’s tallest mountains in its 29 year history. 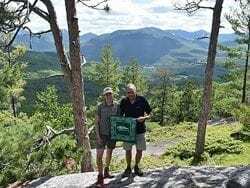 The Summit Stewardship Program is a partnership of ADK (Adirondack Mountain Club), the Adirondack Chapter of The Nature Conservancy, and the New York State Department of Environmental Conservation (DEC). 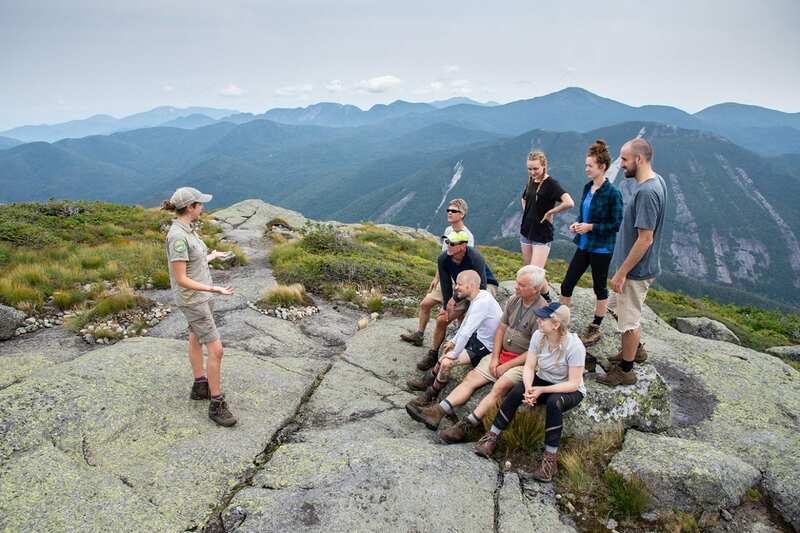 Summit Stewards protect New York’s alpine ecosystem through education, trail work, and research. This milestone was accomplished by interacting with one hiker at a time, in blistering heat, through ferocious biting insects, freezing rain, hail, sleet and snow, for 29 years. During the summer, Summit Stewards are on top of Mt. 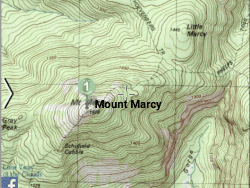 Marcy and Algonquin Peak every day, Wright Peak five days a week and Cascade Mountain on the weekends. Summit Stewards (five paid staff and 20 volunteers) on average hike 1,000 miles and spend 2,500 hours a year educating hikers on the special fragile ecosystem that surrounds them. The consequences of those interactions have positively impacted the Adirondack landscape. Between 2010 and 2015 the Summit Stewardship Program saw a 64% increase in the number of hikers they were interacting with on top of the summits. A recent evaluation of an alpine ecosystem monitoring program has showed that despite this increase in use summit stewards were still able to protect New York’s alpine zone from further degradation. Summit Steward’s educational efforts help instill a life long outdoor ethic in hikers that will help continue to protect this fragile ecosystem for generations. “One of DEC’s primary missions is protecting New York’s natural resources and providing safe, sustainable access to these resources. DEC is proud to partner with the Summit Steward Program and their efforts to protect some of the rarest and most sensitive habitats in the State. DEC depends on the work of the Summit Stewards to help protect the fragile alpine plant communities found on the summits of a handful of the State’s highest peaks. The Summit Stewards education of a half million hikers, and their many other efforts, have been critical in the recovery of alpine zone vegetation, improving the wilderness experience of hikers in the High Peaks Wilderness, and support DEC’s efforts to promote sustainable tourism during periods of record use,” said DEC Commissioner Basil Seggos. “This accomplishment represents great dedication and commitment to the alpine summits, their unique natural resources and to the people that seek to climb and explore them. Many thanks to all of the people that make the Summit Steward Program a success,“ says Neil Woodworth, executive director of ADK. With all the Summit Steward Program has accomplished, every year the program still struggles to fund a full field crew. Those interested in supporting the work of Summit Stewards can donate directly to the program through www.adk.org or to the 507 Fund for Summit Stewardship at www.507fund.org. The Adirondack High Peaks Summit Stewardship Program is graciously funded by the #507 Fund for Summit Stewardship, ADK, the ADKhighpeaks Foundation, the Adirondack 46ers, the New York State Environmental Protection Fund, Patagonia, REI and the Waterman Fund.